Ever since Microsoft launched its Bing search engine last May, there’s been buzz that it’s been talking with Wolfram Alpha to license some of its search data. In August, I was able to confirm that a deal had indeed been struck between the two. 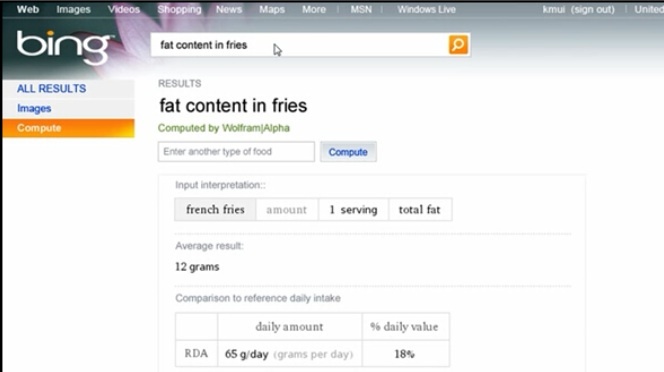 Today, Bing is finally rolling out its first integration with Wolfram Alpha for searches around diet and nutrition. Whenever you do a nutrition or diet-related search on Bing, it will serve up structured data from Wolfram. For instance, a search for any food item will bring up a nutrition tab and summarize nutrition facts about that kind of food, including the total fat in a single serving, along with the percentage of the recommended daily allowance that represents and other nutritional data. The results will be marked as “computed buy Wolfram Alpha.” Wolfram will also power a body mass index (BMI) calculator which lets you enter your height and weight, and calculates your BMI. Perhaps Bing’s deal with Wolfram is to license some of its data to create a specific science category search or a Q&A portion of the site. There has been no discernible surge in fall traffic at Wolfram’s main site. Striking licensing deals with Bing could prove much more lucrative since Bing has much more search traffic and does a better job presenting complex data in an intuitive way. This deal makes Microsoft one of the first commercial licensees of Wolfram’s API. Bing is also releasing two other improvements today. When you hover over a search result, it will bring in more information into the pop-up preview pane, including deep links to the most clicked-on pages in that site and a search box which lets you search the site without leaving Bing. If the result is a Facebook profile page, it will show the person’s picture, their network, and allow you to send a message or friend request. The second improvement is a weather results page which brings together all sports of weather data whenever you search for a place or weather. Much of the data is what you can already find on MSN Weather—multi-day forecasts, satellite maps, and monthly averages—but it gathered on the fly in a new Weather Results page on Bing. You get the feeling that, just like it did yesterday with videos, this may be another content category Microsoft will eventually move entirely from MSN to Bing.